Suppose you're a hotel manager and your hotel is full. That's great, of course, but there's always the temptation to squeeze in more guests. In real life, this might mean clearing out the broom cupboards and getting bad reviews on Trip Advisor, but in the world of maths it's no problem. As long as your hotel has infinitely many rooms, that is. The idea goes back to the German mathematician David Hilbert, who used the example of a hotel to demonstrate the counter-intuitive games you can play with infinity. 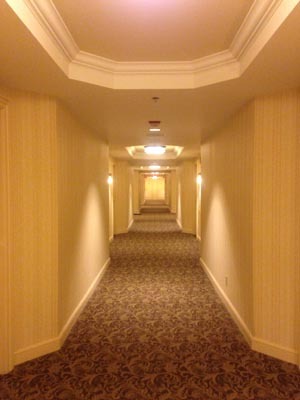 Suppose that your hotel has infinitely many rooms, numbered 1, 2, 3, etc. All rooms are occupied, when a new guest arrives and asks to be put up. What do you do? It's easy. Ask the guest in room 1 to move to room 2, the guest in room 2 to move into room 3, the guest in room 3 to move into room 4, and so on. If there were only finitely many rooms, the guest in the last room would have nowhere to go, but since there are infinitely many, everybody will find a new abode. You'll have to ask the guests to move simultaneously though, because if you ask them to move one after the other, the move might take an infinite amount of time, since infinitely many guests have to move. Using this trick you can actually accommodate any finite number of new guests. If new guests arrive, simply ask each existing guest to move to the room whose number is plus the number of their existing room. As an example, if there are new guests, then the guest currently in room needs to move into room . But things get better still. Suppose an infinite number of new guests arrive, forming an orderly queue outside the hotel. In this case, ask each existing guest to move into the room whose number is twice the number of their current room. So, a guest staying in room moves to room . After this manoeuvre only the even numbered rooms are occupied: rooms , , , and so on. The odd numbered rooms are all free, so you can put your first new guest into room 1, the second new guest into room 3, the third new guest into room 5, and so on. Everybody is happy. This isn’t all. Suppose an infinite number of coaches arrive, each carrying an infinite number of new guests. Assume, for simplicity, that the coaches are numbered 1, 2, 3, etc, and that the seats in each coach are also numbered 1, 2, 3, etc. You start by asking each existing guest to move into the room whose number is twice the number of their current room, as before. This leaves the odd numbered rooms free again. Now tell the passenger of coach 1 with seat 1 to move into room 3, the passenger of coach 1 with seat 2 into room the passenger of coach 1 with seat 3 into room , and so on. In other words, the passenger of coach 1 with seat moves into room . Any power of is odd, so all these rooms are guaranteed to be free. How do you continue this for the third coach? Well, 3 and 5 are consecutive prime numbers. The next prime number along is 7, so we put the passenger of coach 3 with seat number into room . The next prime number after 7 is 11, so we put the passenger of coach 4 with seat number into the room . Generally, you put the passenger of coach with seat number into the room , where is the prime number. Are all these rooms guaranteed to be free? The answer is yes. All the room numbers of the new guests are powers of prime numbers. There's a beautiful result known as the fundamental theorem of arithmetic, which says that every whole number can be written as a product of primes in a unique way. This means that if room number is a power of some prime, then it can’t be a power of another prime. For example, we know that guest number 5 from coach number 1 is allocated room Now if there were another guest allocated to the same room, say guest 3 from coach 2, then would also have to be a power of another prime, eg , which, according to the fundamental theorem it can’t be (and isn’t since ). where is the prime number and is the prime number. By the fundamental theorem of arithmetic, this means that and . Applying the fundamental theorem again shows that the latter implies that and Hence the second guest is actually the same as the first. but if you try to work out that number, you’ll find that your calculator will give up. In theory, though, it’s possible to accommodate all the guests (another appeal to the fundamental theorem of arithmetic will prove this, see the box) and since this is maths, theory is all that counts. So far we have managed to accommodate guests that arrive in three layers of infinity: infinitely many ships, each carrying infinitely many coaches, each carrying infinitely many guests. Can we go further? The answer is yes. You could accommodate guests arriving in any finite number of layers of infinity. What you can't always do, however, is accommodate guests arriving in infinitely many layers of infinity. But then, that's never going to happen anyway. You can find out more about infinity on our What is infinity? page. additional band of rooms possible? Except for the bottom most layer, cant all the layers above it(uptil and including the penultimate layer)start with the first prime number '2' rather than '3'? 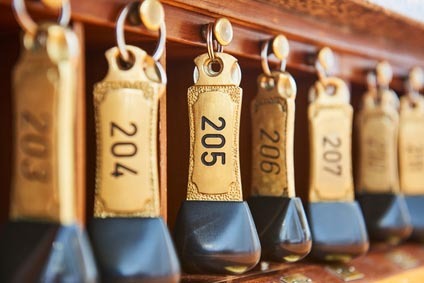 If we were to start with 2 rather than 3, then some of the new guests would end up in rooms with even numbers, which are already taken by the existing guests. is there somewhere where I can read on how to deal with infinite layers of infinity? "This means that she’ll go into room..."
She who? Suddenly one particular female throws the entire argument into a tailspin, but why? If it's important to mention her, then her identidy must be important, but she remains unidentified. Why? Apparently the author doesn't understand the concept and so has to rely on favored speech because without it, she's lost.